Since my last blog entry in June, I’ve been practicing patience. The good news: the stone is on the truck. The bad news: the truck is still in Indiana. The good news: I have found a space in which to work. The bad news: it has no walls or heat. The good news: I have found an assistant. The bad news: our schedules may not mesh. I am sure, however, that all will be resolved by the next posting. For now, I am taking a slight detour. Many of the Renaissance artists had patrons. The artist only had to worry about potential coup d’etats, losing favor in the court, imprisonment, even death if they did not complete their commissions in a timely manner. Payment was only received when the work was unveiled and accepted. When I was in Italy learning to carve stone, I visited a small chamber where Michelangelo hid from his angry patrons. (He was notorious for taking on more work than he could possibly complete in a timely manner.) The walls were covered with “cartoons” – ideas for sculptures never realized. He was too busy trying to balance his books – buy supplies, cover the rent and pay his creditors. Artists today live a similar existence. Patronage appears to be limited to public art commissions. Payment is only received when the work is installed. Still, supplies have to be purchased, the rent covered and the creditors paid. Because I chose to pursue a path of creativity, I accept all attending consequences of that decision. Like most artists, I work a variety of jobs to keep the roof over my head and gas in the truck. Some of the work is creative; some more prosaic. One year, I held 16 different jobs including, but not limited to, the following: dog sitter, house cleaner, landscaper, kayak tour guide, upholsterer, furniture refinisher, faux finisher, project coordinator, caterer, teacher, trainer, writer, and clutter buster http://www.jotheclutterbuster.com. On the twentieth anniversary of my father’s death, I went to Peaks Island, Maine to sculpt a granite memorial. A chronicle of the process became a film: Chorus of Stones: In Four Parts. http://vimeo.com/29998120. After working on the island for 2 years, I am known as a sculptor and filmmaker and a highly responsible house and dog sitter. The Umbrella Cover Museum is located on the same island. It occupies a very small space in the same building as the artist cooperative. (YES, I am talking about a museum of umbrella covers – the sleeve-like fabric that covers the umbrella when you buy it.) About 16 years ago, Nancy 3 Hoffman hung her first umbrella cover on the wall of her kitchen and tacked up a note documenting its provenance. The rest, as they say, is history. In order to be considered for the Guinness World Records, there must be a category in which to compete. It took 5 years but in her indomitable way, Nancy 3 was able to convince the Guinness folks to create an Umbrella Cover Museum category. She then applied for an official count. The requirements for a count are very specific. You need certified judges and also a judge to oversee those judges. You need to complete lots of forms and document the count from start to finish. Currently, Nancy is waiting for the official word. She is also practicing patience. Several years ago, I established a Movie Maker Camp at the Friends School of Portland on Macworth Island in Maine. I taught video production and animation to young filmmakers who created Public Service Announcements during the week-long camp. After completing their PSAs, we take a field trip to the public access station for interviews and a screening. While the arrangements for the delivery of the limestone were being made, I taught at the camp. This year’s productions were entitled Stranger Danger and Scam Security. It is a sad commentary on our culture that fear pervades the lives of our children – both inside and outside their homes. Fortunately, children are able to set aside worry to be in the moment. So we waded in the ocean and looked for crabs at the water’s edge. The skeleton of my sofa has haunted me for years. It then took seven years to find just the right fabric. 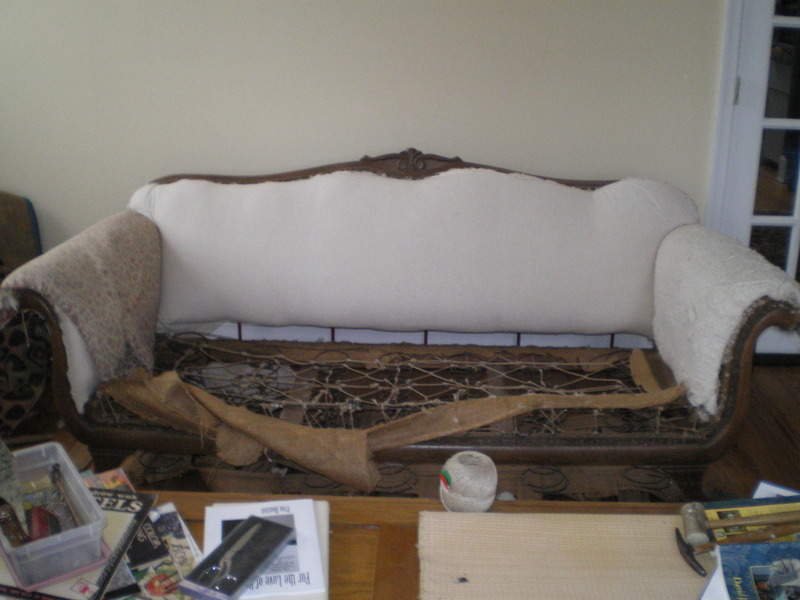 Now that I had selected the stone for Liber and made the shipping arrangements, it was time to re-upholster the sofa. You might be asking yourself: How does upholstering a sofa relate to sculpting? 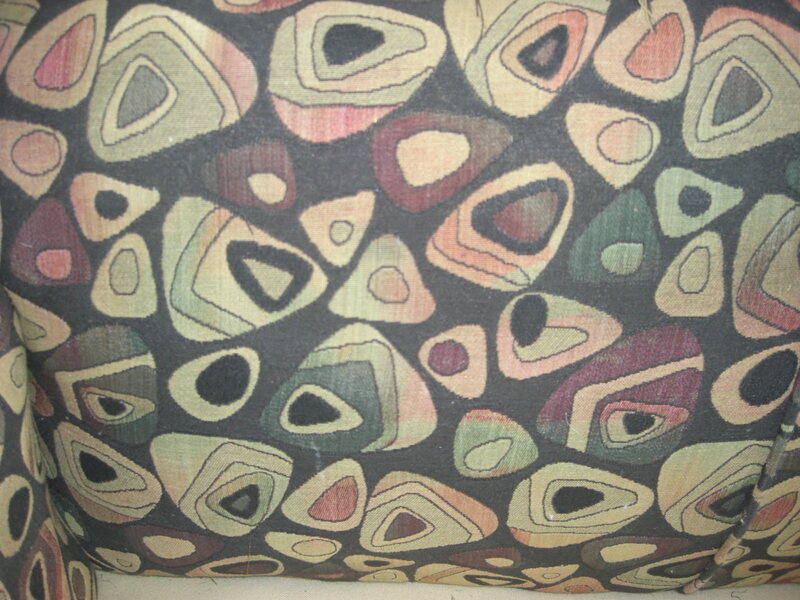 Re-upholstering requires holding onto the image of the finished piece as you work section by section. You take raw materials and fashion them into a discernable whole. You work with your hands. You stand on your feet for long periods. You use specific tools for each step in the process. You are always accompanied by the sound of a compressor and an air powered tool. Sometimes you need help lifting. You look carefully. You do not cut until you are sure. You do not rush. The stone for Liber will probably be transported with stone intended for repairs of the National Cathedral in Washington, DC. On September 29, 1907, the foundation stone was laid in the presence of President Theodore Roosevelt and 83 years later the last finial was placed in the presence of President George H. W. Bush. The damage incurred as a result of the recent earthquake may take a decade to repair. Making a film takes time. Building a cathedral takes time. Creating a sculpture takes time. I can practice patience a little longer. This entry was posted in Art, creativity, Public art, sculpture and tagged Chorus of Stones, filmmaking, Friends School of Portland, library, limestone, Maine, National Cathedral, Peaks island, practicing patience, stone sculpture, Umbrella Cover Museum. What a wonderful gift for writing you have! I enjoyed every word and the emotions evoked. Patience is a beautiful concept – can I have some? Very interesting and thoughtful blog, Jo! And I am still practicing patience about the Guinness World Record – no news as of September 19th. Ommmmmm. Oh yeah..patience. Thanks for the reminder and sharing your story. Great. Lately my mantra also includes “Lighten Up” I do it to the tune of “Tighten Up”! Greatest Motown tune, check it out while you are on a road trip! So, hey, how can I help? I am heading that way. Love the blog Jo, you are a a really, really good writer. I need a LOT of practice at patience.